Have you just moved into a home or want to quickly improve your overall home security? Check out our seven cheap, easy and effective tips that will greatly improve your home’s security. Like the Image? Share It. Here’s the Code. Did you know that most home burglaries (more than 80%) occur by getting in through a home’s door? Your door’s security remains your best line of defense. Even home alarms only sound after someone has compromised your security. 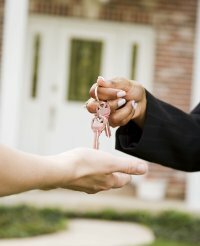 If you’ve just bought a home, the very first thing you should consider is getting the home rekeyed. This process makes your current locks work with a new key. Even if you knew the home sellers our trusted that there’s no way they would use their key to get into your home, it’s not them. It’s the neighbors, baby sitters, pet walkers, kids, nieces and nephews that they’ve given that key to that you want to protect your home from. Rekeying ensures NO ONE with a previous key can get in. Existing locks can be rekeyed, and you do NOT need to buy new locks. In 2017 nearly 7% of consumers became a victim of identity theft. That’s nearly 17 million victims. Does your new home have a lock on the mailbox or one of those community bank of mailboxes? 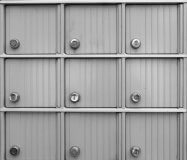 Rekey your new home’s mailbox for the same reason you rekey your home-to keep people with working keys from getting in. If you have a current working key, you local Locksmith sells replacement locks. The lock removes quickly with a single nut in the back. Just take it your local locksmith for replacement (there are several different types). If you don’t have a key, contact your post office. Some post offices will still change the lock for you for about $50. Most will send you to a locksmith. When you don’t have a key the lock can be drilled out and replaced. At the time of a home rekey, ACME Locksmith performs this service for less than the post office. Did you know anyone with a $3 key, bought easily online, and an internet connection can get into your home in a matter of seconds? Read and watch our video What is lock bumping? to learn how to stop someone from using this technique to walk right into your home. There are several ways to stop this home invasion tactic without replacing your existing hardware. Our favorite is now the Ultimate Flip Guard Deadbolt Lock. This little device locks your deadbolt in place so not even a working copy of your key can open the deadbolt from the outside of the home. It can only be secured from the inside of your home so it is ideal for when you are home, or for those who come and go through the garage door. This lock is easy to install and any good locksmith company will have one on their service vehicle for quick installation at the time of a home rekey. Sliding glass doors are also a common entry point. Most people just toss a wooden stick down in the track and are done with it. Unfortunately, this approach is inadequate for a few reasons. First it the Arcadia door is unlocked at the latch, the stick can usually be bounced out of the tracks. Second and more importantly, with a simple screwdriver the sliding glass doors can be lifted off their tracks (even when locked) for easy access to your home. Wooden sticks offer no protection against this. A new product on the market that prevents sliding glass door from being lifted out is a sliding glass door double bolt lock. This lock is placed above your existing lock. It has a bolt that secures the door from both the top and bottom of the lock. It is the only lock on the market that prevents the door from being lifted out of its tracks and it withstands up to 1000lbs of force. Install this product a bit higher on the door and you gain the benefit of child safety by preventing the child from opening the door and walking out. This lock can be easily installed by homeowners our your local locksmith. 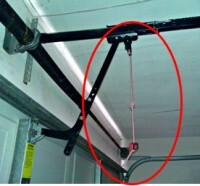 Many garage door openers have an emergency release cord. It’s purpose is to disengages the garage door opener should it ever malfunction. However, when the door is closed, this cord hangs right in front of the garage door seal. It can be easily fished out using a clothes hanger. Once pulled, the garage door will open freely, and an intruder has free access into your garage and all the time required to break into your home. We highly recommend you remove this cord. Once you cut this cord, should you need to exist the garage during a power outage a ladder will get you high enough to throw the release. We tell homeowners to keep a thin wooden dowel in the garage with a hook on the end. The you can release the emergency release with the hook at the end of the dowel. No ladder required. No threat to your home’s security. If you have small children, once they learn to walk, they’ll want to explore. What you don’t want is for them to leave the home. We already discussed the sliding glass door lock that can prevent this and the Ultimate Flip Guard lock and stop them from leaving any door that has a deadbolt on it (they require more strength than little fingers provide to disengage this lock). The next level up in security and preventing kids from existing a wooden home door is to install another deadbolt up higher, our of reach of children. We recommend a Schlage B80 Half Deadbolt . The additional deadbolt has no exterior key so no one trying to get in will know that the deadbolt is there. Because of this it can only be thrown from inside the home and if you are out, you will need another exit (like through the garage). By adding another deadbolt you are distributing force to another point in the door making the door that much more difficult to get into by force for a big door security improvement plus, it will help keep your children safely in your home. This lock will require professional installation by your local locksmith. If you have a pool gate, this safety video by Overflow Pool Repair is a must see. A latch-only on a pool gate for child safety, even when out of reach from a small child, is a disaster waiting to happen. It offers no protection against small children getting in through the gate. You need to install a self locking mechanism up high on the gate, out of reach of children. 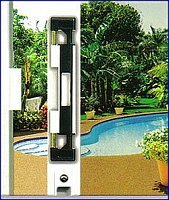 We recommend this magnetic pool gate lock on Amazon . You door latches, strike plates, and hinges are most likely secured by measly 1/2 inch screws provided in the box by the manufacture. These tiny screws don’t penetrate the door’s framing and are a weak point in your door’s security. Take them out and throw them away. Replace everyone of them with 3 to 3 1/2″ screws. 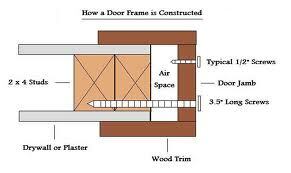 A 3″ screw will penetrate through the door framing into the 2 X 4 behind it for a HUGE improvement to the door’s strength. This, combined with the half deadbolt installation outline above will make your door nearly impossible to kit in. If you want to take it to the maximum level of security, consider a Door Reinforcement System. ACME Locksmith performs free home security assessments as part of any scheduled service. Simply ask your locksmith when he’s onsite, and he’ll be happy to assist you.